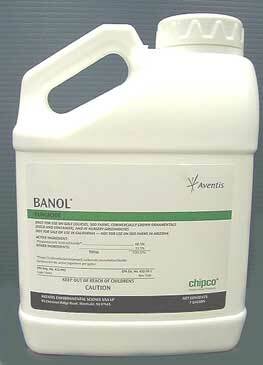 Banol is a a concentrated premium fungicide made by Bayer. It is labeled for turf and ornamentals, and comes in a gallon jug. One bottle will protect up to 70,000 sq ft. or cure up to 35,000 sq ft of these areas from fungal problems! Would you like to see the Banol Fungicide Label? How about the Banol Fungicide MSDS sheet?